Folks, it’s Payday. Greetings from the Burgh, where I am recovering from my twice-yearly bout with walking pneumonia. Folks, if you can drop a few bucks in the hat as I had to take some time off from freelance work to recover from walking pneumonia. So far this month, Payday has raised $1,940 – help us get to our goal of $3,000 this month. This Payday goes out to reporters to reporters at Tronc-owned newspapers, who won recognition for their union today. 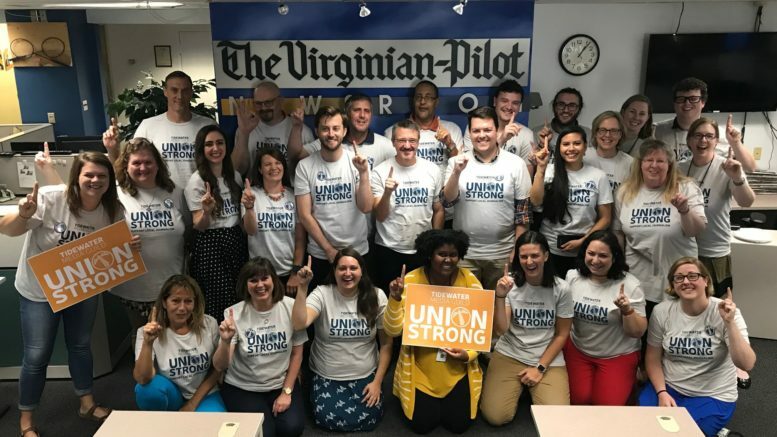 Earlier this month, 83% of reporters at the Virginia Pilot in Norfolk and the Daily Press in Newport News opted to unionize. Today, the newspaper management, Tronc, formerly known as the Tribune Company, agreed to voluntarily recognize the union. The anti-union efforts by Tronc, which were widely mocked by reporters industry-wide on Twitter, created enough negative publicity that Tronc now appears unwilling to fight union drives elsewhere and force NLRB election. In May, Tronc agreed to voluntarily recognize the union at the Chicago Tribune and with their recognition at the two papers in Virginia, the NewsGuild appears confident that they can achieve voluntary recognition. With Tronic indicating that they are likely to sell soon, the NewsGuild is hoping to make major gains among Tronc-owned papers. The NewsGuild victories come as the union continues to make major progress in organizing newsroom in “right-to-work” states. Earlier this week, approximately 75% of the 100 reporters at the Omaha World-Herald indicated that they wish to join a union. The move comes as previous owner Warren Buffett’s Berkshire Hathaway has turned over management of the paper to the notoriously anti-union Lee Enterprises. “Our owner has turned us over to Lee Enterprises, an out-of-state management company,” the union said in a statement released earlier this week. “Since the national chain took over two months ago, the company has shown the door to many talented journalists — and encouraged and accepted retirements from journalists who hadn’t planned to leave. Between layoffs and “retirements” over the past month, we saw a combined 200 years of journalistic firepower walk out the door”. “We are uniting because we want to preserve and promote Nebraska’s best journalistic outlet — and protect the journalists who make it so” said the union. The union drives continue a streak for the NewsGuild of organizing victories in right-to-work states. 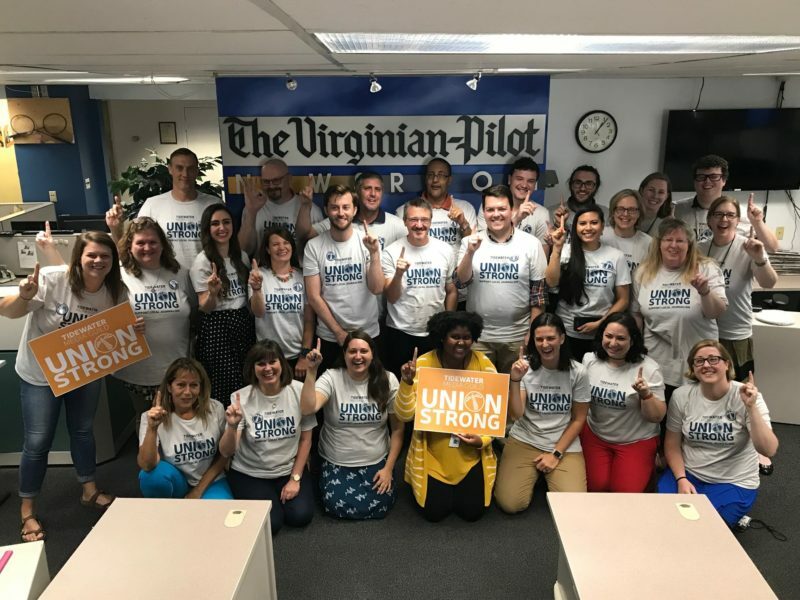 In addition to the victories in Virginia this month, reporters at the Jacksonville Daily News successfully voted to unionize in July, and in February, reporters at the Casper Times, the largest paper in Wyoming, voted to successfully unionize. As unionization becomes more popular in journalism, more newsrooms are expected to unionize in “right-to-work” states. Last week, writing for the Guardian, I previewed the 2,200 strong Tacoma’s teacher strike in the fourth largest school district in the state of Washington as a part of a growing wave of teachers’ strike in smaller cities that appear to go unnoticed. Now, after a week-long strike, the union and the school district have reached a conclusion of the strike. Now, teachers in Tacoma will receive a 14% raise and a 19% raise for support staff. More strikes are expected in Washington as the state has released more than $1 billion in additional funding to school districts; leading many teachers union to negotiate their contracts. 53 Workers represented by three different unions at the Japanese-owned Four Roses distillery in Bullitt County, Kentucky, are on strike this week. Despite completing a $55 million dollar expansion and doubling their capacity, the company is demanding a concessionary contract that would create a second tier of inferior benefits and wages for new employees. Earlier this summer, the Ohio Democratic Party agreed to voluntarily recognize its union. However, now the Campaign Workers Guild is accusing the Ohio Democratic Party of union busting. They say that the Party has hired the anti-union law firm Taft Stettinius & Hollister, a law firm founded by Robert Taft, father of the notoriously anti-union law Taft-Hartley passed in 1947. At the bargaining table, the Ohio Democratic Party has been represented by Conor Meeks, a lawyer who specializes in union avoidance out of Kentucky. The union says that party has proposed a minimum wage of only $12.20 an hour when workers take into account the 60-80 hour weeks that they are supposed to work. Additionally, the Party is refusing to reimburse organizers at the federal mileage rate for organizers that are likely to put thousands of miles on their personal vehicles between now and Election Day. Working class political activists have long complained that unpaid internships in politics have long meant that getting your foot in the door in Washington, D.C. is a privilege reserved for the wealthy. Now, this week, the House of Representatives and the Senate as part of its mini-omnibus spending bill, has allocated $14 million to pay all congressional interns. Beginning, next year, every single Congressional office will be offering paid internships. “At a time when racial, gender and socio-economic diversity among senior staff on the Hill is considerably low, these paid opportunities open the door to so many students who disregarded Hill internships since the majority were unpaid” said the group Pay Our Interns in a statement celebrating the bill. As Hurricane Florence hits this week, its low wage workers will lose money as work is called off. For Kornbluth [a local food server], the decision to evacuate is based on more than losing a few days’ pay. She worried about losing her job if she chose to leave. The evacuation itself, including gas, lodging and meals out of town, also would be expensive. For more go to the Post-Courier. Earlier this week, the Americans Society of News Editor decided to extend their deadline for newsrooms to release their diversity data to October 12th. This move came after only 234 newsrooms out of the 1,700 they are attempting to survey returned their data. Overall, the news industry is 83% white, while the American population is only 60% white, leading many to speculate that newsroom are refusing to release their diversity data to conceal how disproportionately white they are. Newsroom diversity activists are urging readers to contact their local news outlet to release their data. According to a report by KVEO, there have been an increasing number of Latinos born in border towns and delivered by midwives from the 1950s to 1990s who have had issues attaining their passports. Daniel, who was not born in a border town, is just one of these cases. The couple submitted their passport applications along with their birth certificates on June 29. Teresa, who is white and born in Illinois, had no problem getting her passport application approved. For more go to Latino Rebels. Coverage of the killings, and the strike, have been limited, and not because they aren’t noteworthy. Although prisons and jails can be found in nearly every community in America, journalists struggle to keep the public informed. “What happens behind prison walls—with public funds and in the name of public safety—is completely out of public view,” Jessica Pupovac, a reporter in Chicago, says. Pupovac, who has worked with the Society of Professional Journalists to document media access to prisons in all 50 states, has found that, in many cases, authorities will simply avoid reporters they don’t want to deal with. “If they’d prefer a story not get out,” she tells CJR, “it doesn’t.” In addition to a complex network of state policies that restrict everything from the length of interviews to the pens and paper reporters can bring in, journalists say that the system is often unresponsive to information requests and that they must worry about retaliation against their sources. Without direct access, nailing down key details about the incident in April and the ongoing strike is an impossible task. The trickle of accounts from within Lee Correctional has conflicted with what official sources say. Emily Bohatch, a reporter at The State, the daily newspaper in Columbia, South Carolina, has been trying to write about the riot that took place in the spring, but prison officers won’t answer basic questions about the timeline, including what time an ambulance arrived, or when a SWAT team was called. She has also been lodging Freedom of Information requests with the state prison system for documents on deaths behind bars; so far, she’s had no luck obtaining records. “As a journalist, it’s my duty—I need to investigate,” she says. “But there are so many barriers in the way, it’s so difficult, and it takes so long.” Lately, she has been calling Lee Correctional almost every day, asking if the strike has taken root inside; she’s been told it hasn’t. But from some inmates’ lawyers, she’d heard rumors that suggest otherwise. To read the rest, go to the Columbia Journalism Review. That’s it for Payday, throw a few bucks in the get well fund if you can. Be the first to comment on "NewsGuild Wins Two Union Victories in Virginia – Tacoma Teachers Win Major Strike – Kentucky Whiskey Workers Strike"